Crystal Head Vodka is a popular Vodka available from Amazon.co.uk in 70cl to buy online. Visit Amazon.co.uk for the best price for 70cl of Crystal Head Vodka or compare prices on our other Vodka products. A truly staggering premise, the Crystal Head Vodka bottle is instantly recognisable as a skull. The same skill and care has also been taken over the contents of the bottle with water sourced from a glacial lake in South Eastern Canada and more than triple distilled. This provides the clean, crisp and exhilarating taste. Crystal Head Vodka contains no additives or sweeteners. Where to buy Crystal Head Vodka ? Crystal Head Vodka Supermarkets & Stockists. 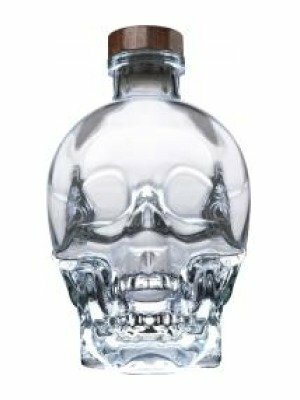 You can buy Crystal Head Vodka online in most retailers and find it in the Vodka aisle in supermarkets but we found the best deals online for Crystal Head Vodka in Amazon.co.uk, DrinkSupermarket.com, TheDrinkShop, and others. Compare the current price of Crystal Head Vodka in 70cl size in the table of offers below. Simply click on the button to order Crystal Head Vodka online now.